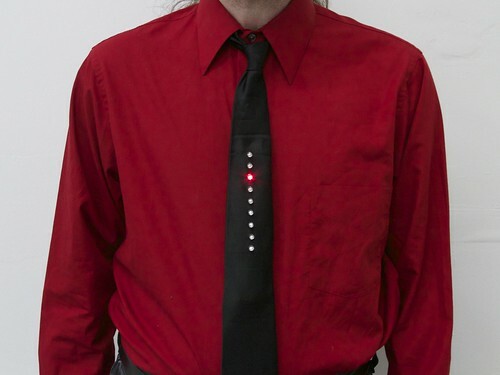 A new Kraftwerk-inspired LED tie kit? Well, almost— With a breath of new firmware, our Larson Scanner kit takes us on a trip to the late 1970’s. The good news is that it’s actually easy to make one. And the starting point? 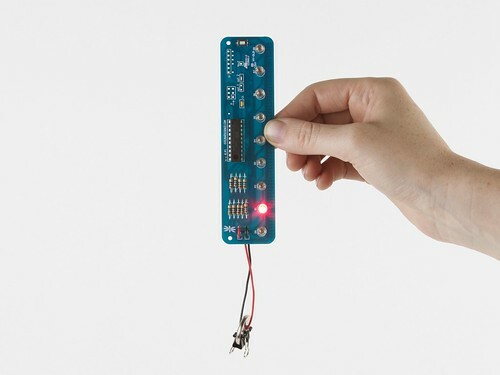 A circuit with nine red LEDs and just the right spacing: our open-source Larson Scanner kit. With minor modifications– a software change and dumping the heavy 2xAA battery pack–it makes a pretty awesome tie. In what follows, we’ll show you how to build your own, complete with video. 1. A necktie, preferably black. The principal difference between “traditional” Larson Scanner behavior and the Kraftwerk-inspired LED tie is just in the software. 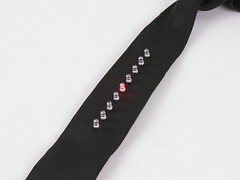 In a Larson Scanner, the LEDs gracefully scan back and forth, whereas our “robot tie” has the LEDs just step in one direction, without the gentle fades. 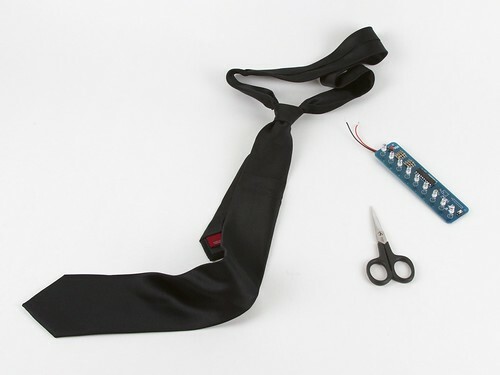 Before we get to the details of assembly, you might want to watch our video demo, that shows off what the circuits do, and walks carefully through the steps of actually inserting the LED board into the necktie. The video is embedded below. If you can’t see it here, click through to view it on YouTube. 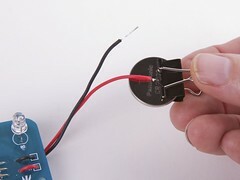 Next, solder a wire jumper– that is, a wire like a clipped resistor lead –between the two holes of location “opt. 2” on the circuit board. This wire jumper is the configuration option that switches it from Larson Scanner mode into “robot tie” mode. The kit is ready to useat this point, and will make a fine addition to your tie with one exception: that heavy 2xAA battery holder, which just doesn’t fit well on a tie. 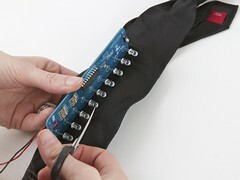 You can, of course, add longer wires and hide the battery holder in your pocket, but we actually have a better solution. 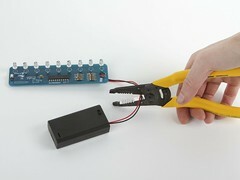 With the batteries removed from the holder, cut the wires to the holder, about halfway. Strip and tin (solder-coat) the wire leads, leaving about 1/4″ – 1/2″ exposed. Next, we use a neat trick: A small binder clip makes a nice coin cell holder! If your binder clip is shiny or silver colored, you probably need to add a layer of tape (masking or packing tape) on the inside as an insulator. 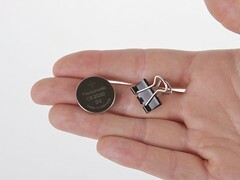 If you have a classic black binder clip like we do here, the black enamel actually acts as a good insulator– you can just go ahead and stick the coin cell right into the binder clip. Connect the red wire to the + side, and the black wire to the –side. 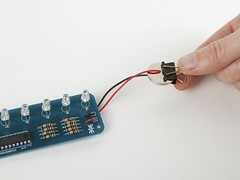 Aside: “Run a big circuit board like that from a coin cell? Are you crazy?” No, we’re not crazy, just slightly mad. It turns out that the Larson Scanner in “robot tie” mode uses just under 2 mA of current when in normal brightness mode, and about 8 mA of current in what we like to call “Hey you– turn that thing down!” mode. You can hold the button for a few seconds to switch between brightness modes. 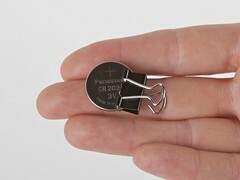 These are very reasonable currents for a coin cell. In normal brightness mode, the battery should last for at least 75 hours. And there we go: Incredibly light, convenient, and bright! Hint #2: Don’t untie the tie at this point. 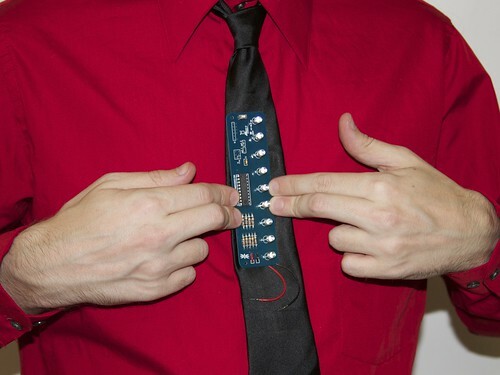 From experience, it will be much harder to tie the tie again once it’s got a circuit board inside. 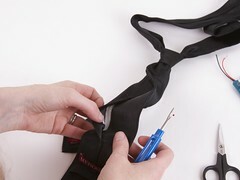 The front-facing part of the tie is a wrapped around piece of fabric, with a long vertical sewn seam on the back side. Using scissors or a seam ripper, cut through part of the seam, so that you can get inside. The tie may have one or more layers of stiffener fabric inside. We’re going to put the modified Larson Scanner right inside, and cut holes in the front surface that the LEDs can stick through. 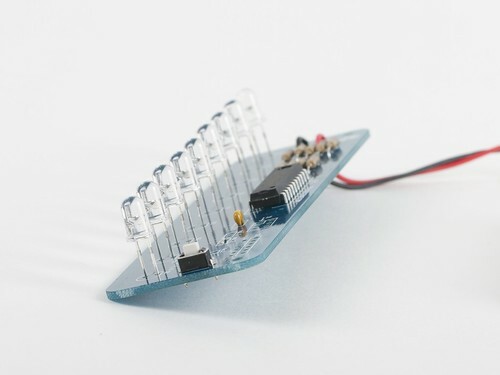 For each LED hole, cut only a tiny slit with the scissors– the LED can “pop” through, leaving none of the background circuit board visible. 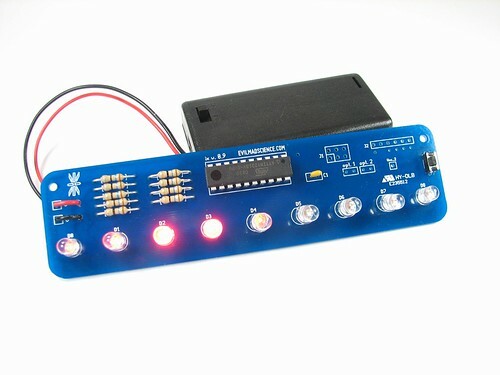 After the first hole, use the actual LED spacing as a guide for where to but the remaining holes. 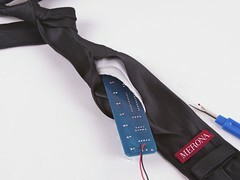 Insert the modified Larson Scanner, pop the LEDs through, and use a couple of safety pins to close up the back of the tie, where you cut the seam. 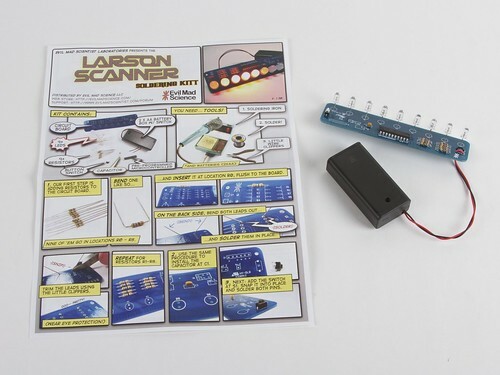 The Larson Scanner kit– complete with the new firmware –is shipping now at Evil Mad Science. at the Evil Mad Science Wiki. This entry was posted in Costumes, Electronics, EMSL Projects, Microcontrollers and tagged fashion, Halloween, larson scanner, LEDs. Bookmark the Permalink. When was the latest firmware released? I have a Larson scanner kit and built it into a shirt! So I guess I’ll be using a bistable witch of some sort instead of soldering a wire to change the program. Yesterday, August 31, 2011. If yours predates that, it’ll need reprogramming to run this code. 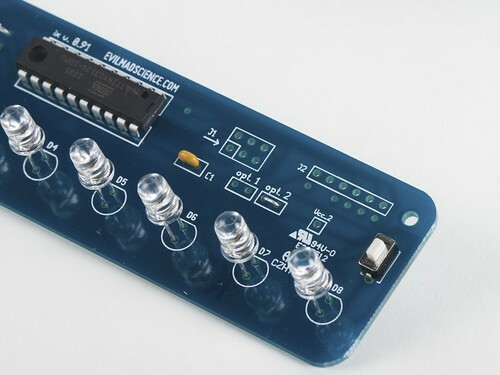 Why does this circuit have 9 separate current limiting resistors for the LEDs, instead of tying the cathodes together and having a single resistor to ground? 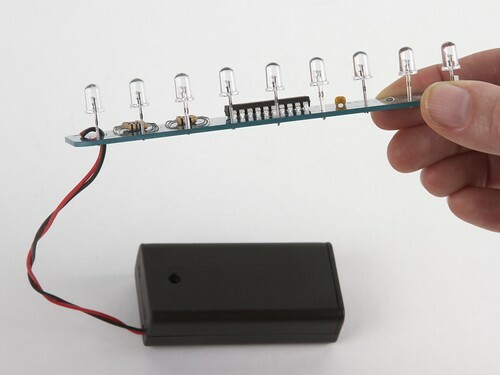 The resistor-per-LED layout allows you to light more than one LED at the same time. A scan looks choppy when you turn LED1 off the same moment you turn LED2 on. It looks better when you turn LED2 on, wait for a moment, then turn LED1 off. The EMSL firmware goes one better by lighting four LEDs at different levels of brightness: If LED5 is on (and LED6 is next), LED3 and LED6 are dim, LED4 is medium bright, and LED5 is at full brightness. That creates a smooth-looking scan with leading and trailing edges. Thanks, I’ve always wondered that. I just finished my version of this tie, and am extremely happy with the results. I’m sending it to my son to wear for Halloween at college; it should be a big hit. I was surprised and pleased with how easy it was to assemble, even though I haven’t picked up a soldering iron since high school! I did make one modification: I took apart a little battery-powered LED tealight and used the housing to hold the battery, rather than use a binder clip. This way the leads would be protected from fraying, and it would be less likely for the battery to fall out. I just finished making this one. And it was really fun doing this. 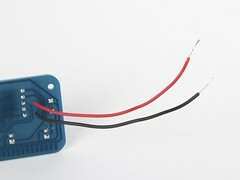 I have never soldered before but with some help from a friend and the easy peasy instructions I managed to do it in a couple of hours! And thank you very much for your excellent and fast service and delivery to Sweden!! !